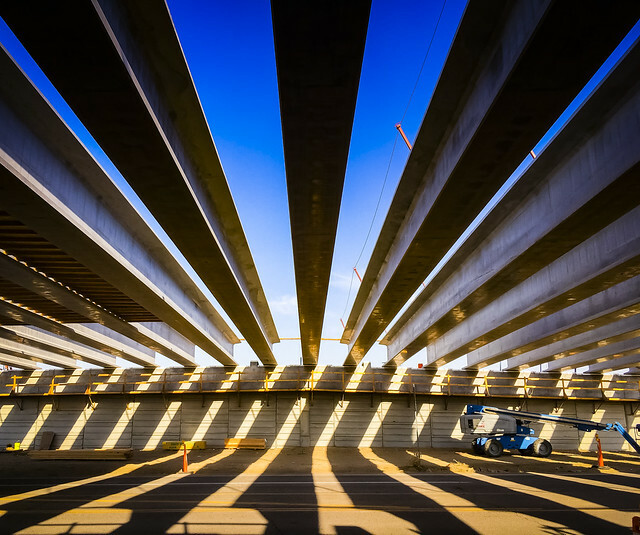 The first of 1,100 girders planned for the Loop 202 South Mountain Freeway have gone up at 17th Avenue and 40th Street along the Pecos Road corridor. The 17 steel-reinforced concrete girders are 145 feet long, weigh up to 131,000 pounds and take an hour each to hoist in place. The ADOT Flickr slideshow above shows the result of recent work at 17th Avenue. The Loop 202 South Mountain Freeway will add 22 miles of highway to the Phoenix freeway system, connecting the east and west valley. The freeway is expected to start taking traffic in late 2019. Learn more about this project and sign up for alerts at SouthMountainFreeway.com.